Awesome day on some great trails. I was packed up early as it Saturday and I didn’t know what the hitchng would be like from Benneydale. I didn’t need to worry. With the luxury of a cafe across the road I headed in for my second cooked breakfast in two days – you cant pass these opportunities up. Polishing off my coffee I headed back across the road to see if I could hitch. As I got across a car pulled up and the fella started heading into the cafe. He saw me with my thumb out and called across that if I didn’t have a lift by the time he’d had a brew he would take me. Then he walked into the cafe momentarily before coming back out and calling over “Do you want a coffee?”. With my attitude of saying yes to opportunities on this trip I should have accepted but politely declined having just had a large, extra shot latte. He headed back in and the next car coming through pulled up offering a ride. Turns out my Maori driver grew up at Pureroa Village and was headed that way to meet his brother before attending his niece’s wedding in an couple of hours. It was a lively drive, full of conversation. What a great guy, but I forgot his name…sorry pal. I heard all about the hungy they had just prepared, his family, the history the local area, his work as a faller for a logging crew, etc… It was basically a free tour of the area. He dropped me on the highway at my turn off and I was on my way for the 4km road walk to the start of the Timber Trail and the Pureroa Forest. Today had to be one of my favourites to date. The weather was perfect, the trails were in great shape and I actually got to see some views from a mountain top. 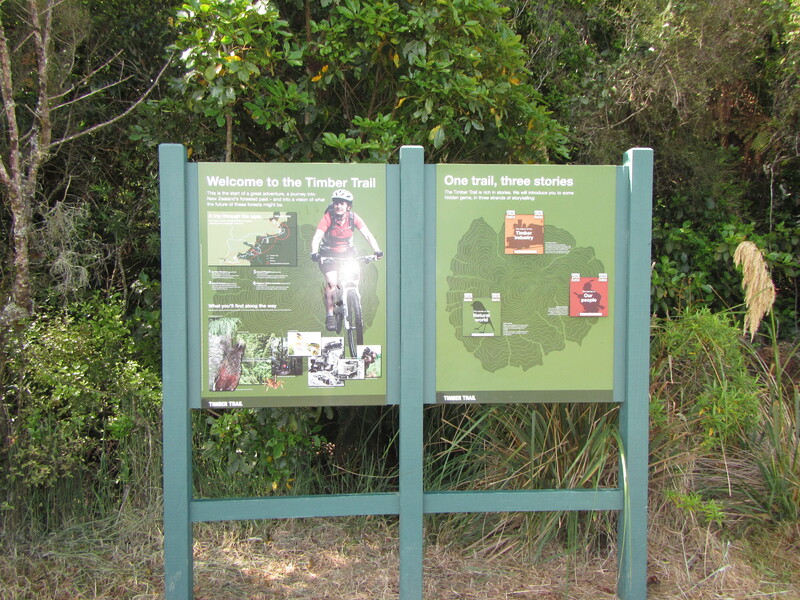 The timber trail is a major piece of infrastructure for the NZ mountain biking community and forms part a national cycle way. As such it was perfectly graded to allow bikes to easily climb high, making use of switchbacks and bridge over any stream crossings. It was perfectly groomed and made for fast walking. Each kilometre is also marked so it made it easy to assess my speed. The timber trail climbed steadily through patches of native timber and the occasional patch of harvested private pine. It didn’t take long at all to walk the 16 kilometres or so to the turn off to Mount Pureroa. The mountain bike tracks skirts around the trig point but the Te Araroa follows up and over before getting back onto the TT. From the trail junction it took another hour to reach to summit but boy what a view. Finally a summit that was not in cloud and a was actually on a clear, sunny day. 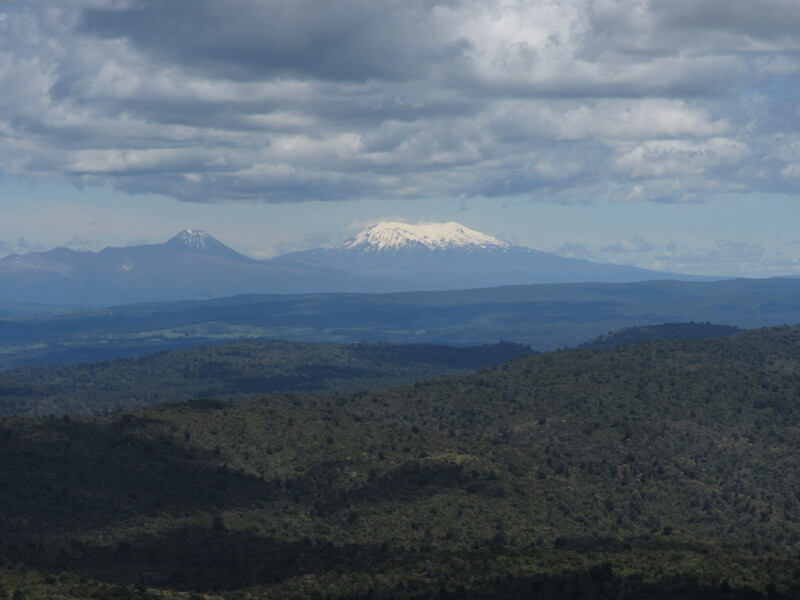 At 1165m the trig point had a commanding and compete 360 degree view across Lame Taupo, Mount Ruapehu and the Kaimamawa Range. The perfect spot for lunch. On top I had full reception and had a quick catch up on email. I managed to get in contact with Sarah who I work with and we are trying to tee up to meet just after New Years so she can join my for a section. Looking at my options for the trail, I’m considering heading straight down the Whanganui River from Taumarunui and see how far the hire companies will let me travel. Hopefully all the way to Whanganui. If this pays off I’ll meet Sarah in Palmerston North to take on the Tararua Range and then head back north to complete the Tongario Alpine Crossing. Thru hikers call this yo-yoing. At the top I also met Luke, another TAer from the UK. I wanted linger up the top but with lunch done, the wind up and starting to get chilled it was time to get going. A 40 minutes descent and it was back onto the well groomed timber trail for a few more kilometres. 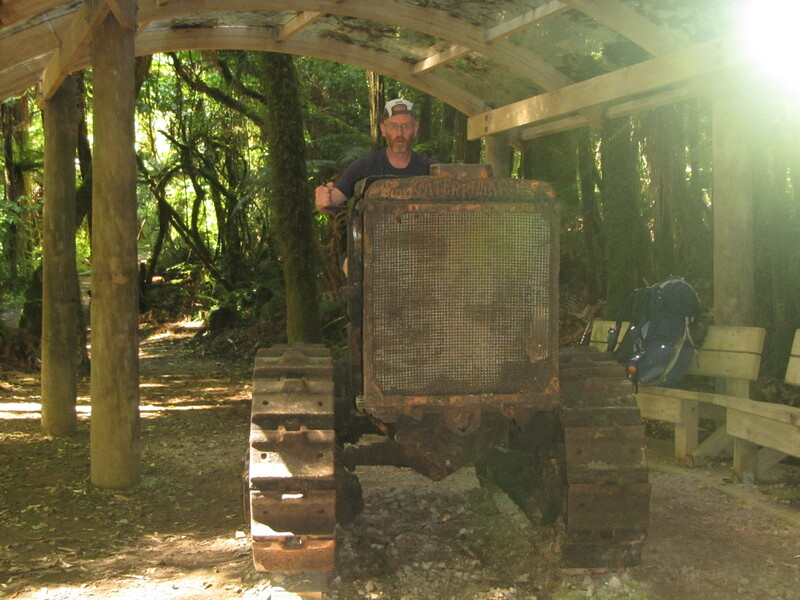 Finally the Te Araroa left the Timber Trail, heading south through forest for another couple of kilometres. As it was forest I was expecting another mud fest but was honestly surprised to find the trail in great condition. I’m sure if it was raining there would be mud patches but nothing to worry about today. 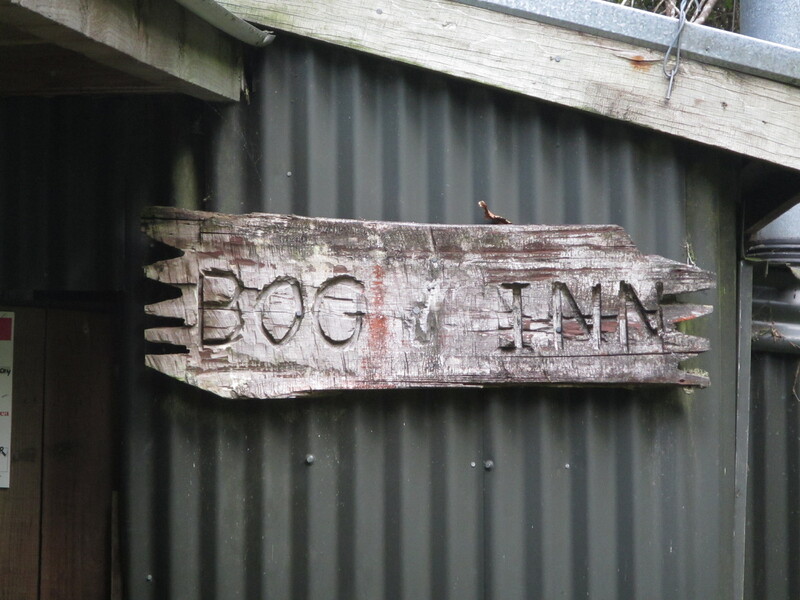 Hitting a track junction that I would be back in tomorrow morning, I turned off for the 15 minute walk to the Bog Inn Hut to spend the night in the tiny 4 bunk DOC hut. Luke joined me at the hut later that day, where we cooked up dinner outside and enjoyed intermittant conversation between reading our books.